Plums are in season in September and this pudding is a great way of using them (other than eating!). Have this pudding for dessert on its own with a cup of tea. Mix the butter and sugar together until it is a light and fluffy texture. Beat in the egg yolks, orange rind and juice. Then stir in the ground almonds and flour. Whisk the egg whites until stiff and gently fold them into the butter/sugar mixture. 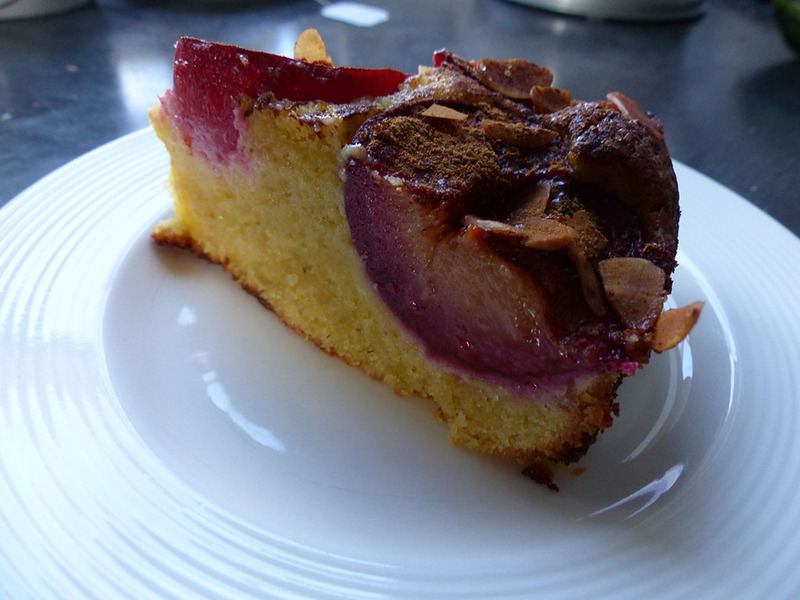 Put the mixture into a greased baking tin and push the cut plums into the cake mixture with the skins facing down. Mix together the flaked almonds, sugar and cinnamon and sprinkle it over the top. Bake in a 180C (gas mark 4) oven for about 35-40 minutes or until the cake is baked through. You can test this by sticking a skewer into the cake and if it comes out dry, your cake is cooked! For a vegan or dairy free option, you can replace the butter with Pure Sunflower Spread and the eggs with Orgran Egg Replacer. I am pretty sure you can use 2 tsp of egg replacer instead of the 3 egg yolks and then follow the original recipe and the guidelines for egg whites on the packaging.